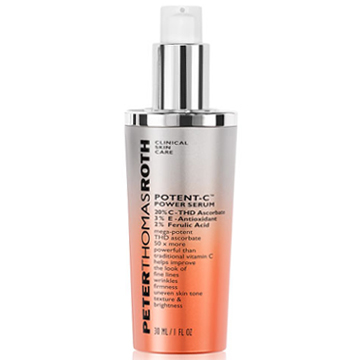 Peter Thomas Roth Potent-C Power Serum is a rich moisturizing serum that benefits up to 50X more effectively than traditional Vitamin C.
Due to a jaw-dropping concentration of 20% THD Ascorbate, it provides brighter, fresher and younger looking skin within 7 days. Featured with two ultra-powerful antioxidants, 3% Vitamin E and 2% Ferulic Acid, it delivers a complete and advanced anti-aging, firming and brightening treatment. Peter Thomas Roth Potent-C Power Serum helps improve the look of fine lines, wrinkles, firmness, uneven skin tone, texture and brightness. Minimizes fine lines, wrinkles, uneven skin tone. Helps improve hydration by attracting and retaining water.